A few more sample templates have been added to the gallery, this time with financial and conference themes. 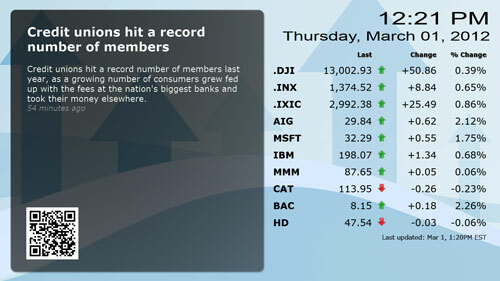 The financial template utilizes Google Gadgets for both real time stock quotes and also for a financial news feed. Customize the stock quote gadget to display any number of your own symbols. The news feed gadget allows for any RSS/ATOM feed and supports rich HTML content. The QR code on this template points to the RSS feed for mobile viewing. 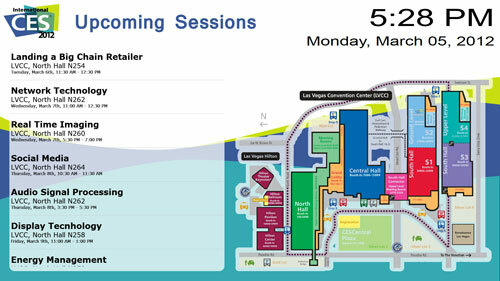 The conference template provides an example of using Google Calendar to supply a fictional event schedule for this years CES show. This of course is just an example which is loosely based on actual events from the show. Again we used a gadget to pull data from the calendar which can display events in both a consolidated (as shown) or tabular format. Events are displayed in chronological order with the next scheduled event shown first. Viewers are able to quickly determine the next event and how to get there. We've also published the original template art for all sample templates in Photoshop PSD format which can be downloaded from our support site here: http://support.reveldigital.com/kb/advanced-topics/template-gallery-downloads.